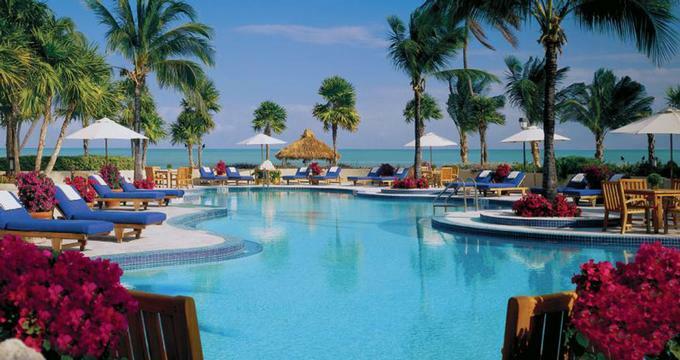 Cheeca Lodge and Spa, located in the village of Islamorada in the Florida Keys, is a dream vacation destination for couples, honeymooners and families. 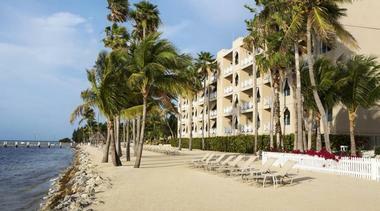 This romantic Florida resort offers a perfect blend of relaxation and fun in a stunning tropical setting. You may also like: 25 Best Things to Do in Key West. The hotel’s 214 rooms, suites, and bungalows offer guests casually elegant accommodations that create a sense of comfort and relaxation. All of the rooms are decorated in a West Indies style, and each has a private balcony that boats a view of the ocean, lagoon, or golf course. Each room is equipped with a 42-inch plasma TV, mini refrigerator, and an in-room safe. Other amenities guests can enjoy include complimentary Wi-Fi, daily newspaper delivery, an assortment of Starbucks coffees and Tazo teas, fine linens, and luxury bath accessories. The Lodge Island View King Suite boasts 850 square feet of living space, panoramic views, and a large, private lanai with an open-air spa tub. The spacious bathroom sports his and hers closets and wash basins and a glassed-in rain shower for two with an island view. The Cheeca Spa features seven treatment and two facial rooms, a wet room with a Vichy shower, a fully-equipped fitness center, an adults-only lap pool, poolside cabanas with butler service and Internet access, a steam room, ocean-side massages, rose petal baths, and a spa boutique. The spa offers traditional hot stone, reflexology, prenatal, Swedish, and deep tissue massages. The spa also has customized treatments like the Signature Hot Lava Shell massage, which utilizes polished Tiger Clam Shells to encourage the flow of energy throughout the body, and the Fire and Ice massage, which alternates hot and cold therapies to stimulate circulation and reduce inflammation. Services that can be added on to massages include baths with scented candles (rose petals can also be included), scalp massage, and anti-aging hand and foot polishing. Massages can be performed in the guest rooms or oceanside. Spa facials include the Firming Hydration, which lifts, tightens and rejuvenates skin – decreasing the appearance of fine lines and wrinkles; the Gentlemen’s Hot Towel, which utilizes deep cleansing and purifying techniques, and the Calming Recovery, which nourishes skin without irritating it. Other facial treatment options include eye and lip therapy and neck and décolleté rejuvenation. Fitness training at the spa includes classes in yoga, yolates (a combination of Pilates and Vinyasa yoga) deep-water training, and body sculpting and toning. Body treatments include body polishing, warm mud treatments, the Sea Tonic wrap, and Sunburn Rescue, which utilizes a restorative gel with soothing chilled stones. The Atlantic’s Edge restaurant offers fresh seafood, prime steaks and locally sourced, organic produce for breakfast and dinner. The restaurant boasts floor to ceiling views of the Atlantic Ocean, with both indoor and outdoor seating available. The breakfast menu includes breakfast staples like eggs benedict, waffles, and pancakes, as well as a lavish buffet. For dinner, the menu offers delightful choices such as Seafood Towers with oysters, lobster, shrimp and ceviché; Ahi Tuna Tataki with avocado cream, pickled red onions, and ponzu; Guava Glazed Mahi with coconut bamboo rice, tempura baby bok choy, and Thai coconut curry sauce; and Tahitian Vanilla Bean Crème Brulée, which is served with fresh berries. Another dining option is to have your own catch of the day prepared however you prefer. The Atlantic’s Edge, as well as Cheeca’s other restaurants and lounge, features an extensive wine list with over two hundred carefully selected varieties, which has garnered Cheeca Lodge and Spa the Wine Spectator’s Award of Excellence three times over. In addition, the Atlantic’s Edge has been honored year after year with the American Automobile Association’s Four Diamond Award for excellence in dining. Limoncello is Cheeca’s Tuscan-style, family friendly, Italian restaurant. The dinner menu choices include Crispy Polenta Bruschetta with tomato, basil, fig, mascarpone, artichoke pesto, and roasted tomato; Winter Squash Insalata with pistachios, pomegranate, brown butter, and sage; Seafood and Squid Ink Fettuccine with calamari, mussels, and shrimp; Veal Cutlet with hen of the woods mushrooms, green pole beans, lemon zest, and a white wine peppercorn sauce; and Coconut Panna Cotta with black mission figs, pistachios, and fresh berries. Limoncello also features a custom designed kid’s menu. Nikai Sushi offers guests an intimate dining experience with its unique, twenty-seven table layout. Chef Sy Hire is known for his ability to customize each sushi platter to each diner’s individual tastes. Among the menu’s extensive list of nigiri, sashimi, and specialty rolls are the Big Kahuna roll, which is tuna & avocado topped with lobster salad, pineapple ginger glaze, and toasted macadamia; the Sashimi Blossom, which includes tuna, escolar, hamachi and tasmanian salmon with tobiko, wasabi tobiko, and yuzu ponzu; and Maguro Tartar with spicy tuna, truffled ponzu, and wasabi tobiko, as well as traditional Japanese appetizers such as wakame seaweed and squid salad and miso soup. Nikai also offers more than thirty-five hot and cold sakes. The Tiki Bar is a casual venue where they can savor light fare right on the palm-lined beach. Menu options include wood fired pizzas like From the Vine with San Marzano tomato Sauce, fresh mozzarella, fresh basil & extra virgin olive oil; hamburgers such as the Barbeque, Bacon, and Cheddar Burger; the Chicken Salad Wrap with grapes, celery, pickled red onion, aioli, spinach, and tomato; and Cheeca Conch Fritters, with key lime aioli. They also offer a variety of Keys-inspired cocktails and an assortment of beers. The Chart Room is considered to be one of the most exclusive beachfront lounges in the Florida Keys, and is decorated in a sumptuous West Indies style. Guests can relax in overstuffed leather chairs amid trophy game fish and old photographs that showcase the history of Cheeca Lodge and Spa. Outdoor seating is also available – from the sundeck guests can take in a lovely view of the pier and the historic Alligator Lighthouse beyond. Islamorada has long been known as “the sport fishing capital of the world,” and two types of charters are offered there. Backcountry (or flat boat) fishing takes place in small skiffs that can accommodate two to three anglers. Fishermen go to the shallow waters of the Everglades and Florida Bay where the guide will pole through the waters in search of elusive bonefish, snook, and tarpon. Offshore fishing takes anglers out into the deep waters of the Atlantic Ocean where massive game fish like swordfish, wahoo, yellowtail snapper, and sailfish abound. Offshore charter boats can accommodate up to six people. Both types of charters are available for full or half days. The concierge at Cheeca Lodge and Spa assists in pairing guests with a captain and guide chosen specifically for guest age and skill level. The captain provides a cooler, bait, tackle, and fishing licenses. Items that anglers need to bring with them include a lunch, beverages, sunscreen, a hat, non-slip shoes, and a camera. Guests who desire an outing on land can enjoy Cheeca’s 9-hole par 3 golf course designed by Jack Nicklaus or play on one of six lighted tennis courts. For kids, there is the Camp Cheeca Children’s Program, which can include fishing off the pier, arts and crafts activities, star gazing, nature hikes, lessons about the Florida Keys ecology, treasure hunts on the beach, relay races in the swimming pool, and snorkeling in the lagoon. Each day, children are presented with a new theme: Everglades & Alligators, Shells & Sand, Ocean Mammals, Trees, Flowers and Fruit, Florida Birds, or Ocean & Coral Reefs. The camp is open Monday through Saturday, with both half and full days available. Participants are asked to bring a bathing suit, a change of clothes, sunscreen, and shoes. Cheeca Lodge and Spa boasts over 4,600 square feet of indoor event space, with numerous outdoor venues for small affairs or large gatherings, accommodating anywhere from ten to two hundred guests. An oceanfront banquet room offers guests a view of the ocean through floor to ceiling windows or from the outdoor covered terraces. The unique spaces available include the Bougainvillea Ballroom, a 525-foot pier, 1100 feet of palm lined shore, a private, 39-passenger Corinthian motor catamaran, Tahitian-inspired Spa Island, and decks with wooden foot bridges, water features and tiki torches. Cheeca Lodge and Spa can provide guests with customized event management, including catering, specifically tailored to their needs. The resort can also accommodate business retreats, meetings, or reunions consisting of ten or more guests with staff members available to plan itineraries. 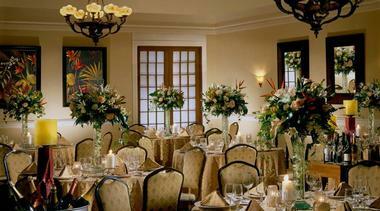 An extensive banquet menu is available for such events, and it can cover breakfast, lunch, or dinner. The breakfast menu includes such options as continental or traditional breakfasts; a Caribbean-inspired meal, which includes burritos with egg, chorizo, cilantro, and fresh salsa, and Cuban-style pastries; and a Miami-style meal with seasonal tropical fruit, and arepas, which are Caribbean corn cakes filled with cheese. Lunch can include deli sandwiches, a variety of soups, packed lunches, or plated lunches like Pineapple Chicken and Shrimp Scampi. The dinner menu offers delectable choices such as Jamaican-Style Jerk Chicken, Coconut Crusted Snapper, and Pork Tenderloin with a cherry port glaze, yucca fries, and roasted corn. The dessert menu provides endless choices including Guava Glazed Cheesecake Lollipops, Guava Macadamia Bread Pudding with crème Anglaise, and Tropical Fruit Tartlets. Rooms start at $195 per night. 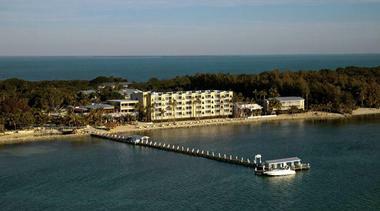 Find more great Romantic Beach Vacations and Romantic Island Getaways in Florida.